Guava is a rich source of Vitamin C which is known to help protect cells from damage caused by cancer causing free radicals. 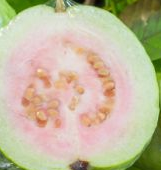 Guavas are loaded with fibers. Fiber plays a vital role in lowering the levels of blood sugar in the blood. Fiber also helps in cleansing the digestive system and maintaining free bowel movement. Retinol a type of Vitamin A found in abundance in guava is responsible for good eyesight. Guava makes a perfect tasty substitute to carrots to get enough vitamin A for maintaining good eye health. Guavas are rich in a mineral known as folate. 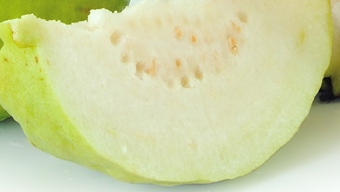 20% of our daily folate (Vitamin B9) requirement is fulfilled by 1 medium sized Guava. It is not produced in the body and is essential for DNA repair and synthesis. It’s also known to help promote fertility in humans. Guava contains as much potassium as banana. A medium sized guava can fulfill as much as 9% of our daily requirement of potassium. Potassium is a mineral which is said to help in managing blood pressure by maintaining the electrolyte levels in the body. The trace element copper is very good in maintaining good functioning of the thyroid gland. Guava is rich in this compound. Many health problems can be caused if the thyroid gland doesn’t function properly. Manganese helps the body to absorb the vital nutrients from the food we eat. Guava is loaded with manganese. Manganese is the mineral which helps us get all the key nutrients like biotin, vitamins, etc from the food we eat. Guava is a rich source of magnesium. The magnesium present in guavas helps to relax the muscles and nerves of the body. Eating guava after a hard workout, certainly helps to relax your muscles and give your system a nice energy boost. Guava helps to maintain good cognitive function of the brain by maintaining good blood circulation to the brain and also nourishing the brain with Vitamin B3 and Vitamin B6. Vitamin B6 which is good for nerves. It helps in relaxing your nerves. Guava can help you in losing weight as it slows down the absorption of sugar in the blood which keeps you from losing weight. Due to this ability of guava to slow down the absorption of sugar in the blood which makes this fruit great for diabetics. Guava is high in potassium content. A medium sized guava contains 688 mg of potassium which fulfills as much as 9% of our daily requirement of potassium. Having potassium rich foods like guava when you are trying to lose weight helps in increasing muscle mass and burning more fat. Guava contains 63% more potassium than bananas. 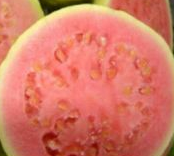 Guavas are rich in fiber. A medium sized guava contains approximately 9 grams of fiber. Fiber rich foods play an important part in your weight loss plan. Having foods rich in fiber like guava help to improve your digestive system which in turn helps the body to get rid of toxic and unwanted fats. Fiber also keeps you full for longer, which helps in reducing the amount of food you consume. Guava contains zero cholesterol and is also very low in digestible carbohydrates. Guava is a great addition to your low carb diet for weight loss. Since it is cholesterol-free, it keeps you away from cardiovascular diseases. Guava is a fruit which is rich in fiber,which makes it an excellent natural body detoxifier. Guava works as a great addition to your diet when you want to lose some weight. It helps the body get rid of toxins by improving the digestive system. This, in turn, helps you to burn more fat. Guava Juice is known to have antibacterial properties. Guava can shrink and contract any open tissues in your body which prevents it from being attacked by bacteria. The anti-bacterial properties present in guava can get rid of the harmful toxins and bacteria from your body. Stomach problem like constipation and diarrhea can easily be treated at home by having a glass of guava juice. As we know that guava can shrink and contract any open tissues in the body. 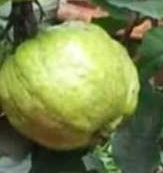 This property of guava helps to shrink the canals of the active intestine and stabilizes it. Guava juice is rich in fiber which helps in treating Constipation by improving the bowel movement. Consume guava juice just before breakfast shows the best results to get relief from constipation. Guava is loaded with antioxidants. Lycopene is a powerful antioxidant present in guava, which helps your body to fight the harmful free radicals which cause cancer. Hence having Guava juice can help to decrease the cancer cell development. 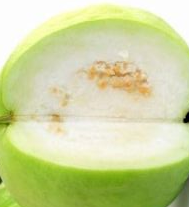 For ages Guava juice is used as a good home remedy to cure Flu. Frequent changes in the weather is the main reason for flu. To fight flu viruses we need to have a strong immune system. Consuming foods rich in vitamin C is very important to fight off flu-causing viruses and boost the immune system. Guava juice is an excellent natural source of vitamin C which improves your immune system. Deficiency of vitamin C causes scurvy. Scurvy is characterized by swollen bleeding gums and the opening of previously healed wounds. Drinking guava juice is an amazing home remedy to cure scurvy. Guava juice is a rich source of vitamin C.
One of the most deadliest diseases known to the human race is dengue, caused by the dengue virus transmitted by the Aedes mosquito. Dengue has symptoms like high fever with headache, severe muscle pain, joint pain, red rashes on the body and a drop in platelets count. Guava is loaded with many essential vitamins like vitamin C, A and other minerals which are important to improve the immune system. Guava juice works as an effective remedy to treat dengue fever. Drinking guava juice at least three times in a day will help to reduce the symptoms of dengue. For ages guava is known to make your teeth strong. Guava fruit juice has astringent properties which give you an instant relief from toothache and mouth and gum sores. Guava leaves are also used to treat Toothaches, Guava leaves have anti-inflammatory properties. Gargling with water infused with fresh guava leaves can give you relief from tooth ache, healing gum, mouth sores and also helps in treating sore throats. Guava Leaves (Amrood ke Patte) also have antibacterial properties which protects the teeth and gums. Many toothpastes and mouth fresheners use Guava leaves as an ingredient in them. Chewing 1 or 2 tender guava leaves daily can help you maintain your oral health. Guava helps to improve blood circulation in your body. Guava is loaded with potassium, the potassium helps in regulating blood pressure by reversing the effects of excessive sodium in the body by regulating the levels of electrolytes in the body. You can regain your skin’s radiance and freshness by using Pink guava which helps in beautifying your skin. You can use pink guava to improve your complexion, by making your own simple guava scrub at home.To make your own homemade guava scrub you need to mash some guava and mix it with an egg yolk and apply this mix on your face. Rinse your face with warm water after 20 minutes. Use this mix once a week to remove dead cells from your skin and lighten your complexion. This scrub will remove all impurities and makes your skin fresh. Pink guavas are loaded with lycopene which is an antioxidant that protects your skin from UV rays damage and other pollutants. A medium sized guava contains about 2.9 grams of lycopene which is twice the amount present in tomatoes. Guava is loaded with antioxidants and detoxifiers like vitamins A, B, C and potassium. These antioxidants present in guava fight against free radicals, which keeps your skin safe from signs of premature aging like wrinkles and fine lines and keeps your skin glowing. Lycopene present in guava protects the healthy cells from toxins that accumulate in the body due to metabolism and environmental pollution. Guava is loaded with vitamins, minerals and nutrients which helps in keeping your skin tone maintained and your skin fresh and wrinkle free. Guava is known to effectively in enhancing skin texture, tightening the loosened skin and reviving the lost elasticity of the skin. Guava contains astringent properties which helps in keeping your skin free from blemishes, acne, wrinkles and pimples. Daily washing your face with a decoction made from immature guava fruit and its leaves helps in beautifying the skin. A face mask made from guava leaves helps you to get rid of acne and dark spots. To make this amazing guava leaves face mask you need to take some guava leaves and mash them to make a smooth paste. Clean your face with water and apply this face mask on your face. Using this face mask for 3 days continuously will give you excellent results to get rid of acne and dark spots. For your skin to be healthy it needs to be properly hydrated. Your skin will be hydrated when it receives enough water. Doctors recommend us to have 8 glasses of water in a day to keep yourself hydrated. Guava comprises of 81% of water which makes it amazing to keep your skin hydrated. Guava is loaded with vitamin C and provides more than twice the recommended daily value of vitamin C which is vital for our skin’s healing as it helps in generation of collagen, which is an important substance that gives your skin its firmness. It also provides about 2% of the recommended daily requirement of Vitamin K. vitamin K improves blood coagulation, impairment of which causes skin redness and irritation. This property of vitamin K present in guava makes it amazing in treating dark circles, spider veins, rosacea, acne irritation, and splotchiness of skin. Guava leaves can help in getting rid of blackheads, you can make a paste by blending the leaves of the guava fruit with little water and apply this paste on your nose to remove blackheads. 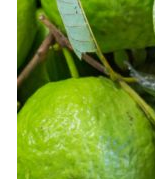 This Guava leaves scrub can also help in treating skin itchiness and skin allergy. Guava is loaded with nutrients like Vitamin A, vitamin C, folic acid, potassium, copper, manganese, fiber, flavonoids and other phytochemicals. All these vitamin and minerals are very beneficial for healthy hair growth. Vitamin C present in guava promotes healthy hair growth and also helps in stopping hair fall.